How Can You Build Your Online Presence and Attract More Clients? Real estate is one of the largest transactions most people will encounter in their lives; so naturally, selecting the right real estate agent requires extensive research and interviewing. As buyers and sellers continue to use the internet as a primary source of information when conducting research throughout the real estate transaction, it is imperative that real estate agents grow and build a solid online reputation in order to stand out from the competition, influence people’s perception, and brand their business to even land an interview. With social media becoming increasingly prevalent in a number of marketing initiatives, it provides a principal foundation that real estate agents and other small business owners can capitalize on when developing and enhancing their online reputation! Plus, there are an assortment of new tools and apps that have been introduced that allow users to incorporate several different methods into one platform! From branding and blogging, to creating an effective website and obtaining client reviews, there are several opportunities that will showcase you and your business in the most favorable light and boost your online reputation. Perception is everything, and it is imperative that your potential clients are receiving the message that you want to convey. However, before you can determine what that message is, you have to define your brand. Reflect on the qualities that differentiate you from the competition. What are your strongest attributes and skills? What is your area of expertise or specialty? When you determine what quality or specialty it is that represents you as a Realtor, as well as your business and brand, reinforce it in everything you do, especially online. Continue to highlight the other qualities that make you the best candidate for the job, as well, including your experience, awards, accomplishments and specialties. Every real estate agent should have their own website so that potential clients can discover them and see what their about outside of referrals or social media. Many times, an agent website is the first thing a client sees, so it is crucial to create a good first impression with a well written real estate biography and a professional head shot of yourself! Your biography should adequately represent you and your brand. Provide content that engages visitors and keeps them on your site, such as helpful information that buyers and sellers are likely to research, featured listings in the area, and client testimonials. Use key words in the content that you include on your website, such as real estate, real estate agent, and the cities that you service so that search engines will pick it up in a search inquiry. Embed links to your social media pages so that visitors can easily access your Facebook, Twitter, Pinterest, YouTube, etc. and learn more about you, your brand, and what you bring to the table. Surveys show that the majority of internet users spend an overwhelming amount of time on their social media sites daily, including Facebook, Twitter, LinkedIn, Pinterest, etc, so maximizing your presence on social media is a key component to building and maintaining an impressive online reputation. Since social media allows you to connect with clients every time they log in, it provides an ideal platform to brand yourself and your business. 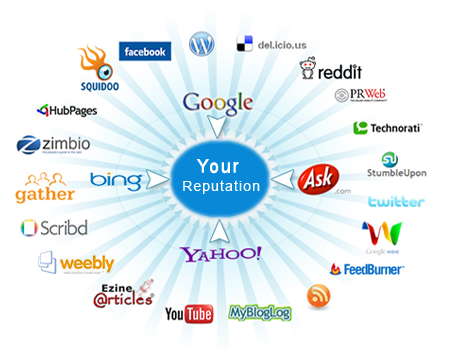 Therefore, it is crucial that you utilize each social media platform available in order to expand your reach. Plus, potential clients need to be able to find you on every outlet imaginable. Upload your real estate biography to each of these sites, and include key words that are relevant to your neighborhood, specialty, and city. Join real estate discussions on your LinkedIn groups, and ask for endorsements to legitimize your business. Connect with clients on Facebook, and ask them to write a review. Engage your fans, followers, and connections by posting, pinning, and sharing useful content that reinforces your brand, such as helpful tips for buyers and sellers, market trends, housing statistics, ideas for the home, etc. Become the voice of authority when contributing to real estate discussions through your social media, blogs, or message boards. Incorporate video into your social media marketing. It might not do much to affect your online reputation, but it enhances your online presence and impresses potential clients. Keep all social media posts professional, even on your personal profile. Avoid posting anything that could alienate potential clients or cause them to perceive you in a less favorable light. Develop a hub of online resources about your community and its neighborhoods that provides helpful information to buyers and sellers and portrays you as a neighborhood specialist. Include neighborhood statistics, schools, tax rates, amenities, average homes sales, and update the information frequently to keep it current. Create a separate website where you can assemble such material, or embed a forum on your own website that can be easily accessed by visitors and found in search results. Start a blog. Writing thoughtful, useful, relevant content is an extremely efficient and constructive way to build your online identity, share your expertise, and brand your business. When publishing a blog, think about your audience. Write about topics that your target audience is most likely to surf the web for. Use key words, titles and tags appropriately so that you can control your online search results. Personalize the content to show readers a glimpse of your personality. Offer personal examples or stories that support your thoughts, advice and opinions. Once you publish an article to your blog, share it across every social media forum to increase traffic to your article and blog site, as well as optimize SEO. Embed links to your social media pages, website, etc. on your blog to create a domino effect with consumers who read your article. This not only encourages your audience to interact with your brand and engage in a call to action, but it also facilitates their online research without ever leaving your site. Publish blogs to your site several times a week, and structure every article with content that emphasizes your brand. Perhaps the most influential contribution to your reputation, research indicates that consumer reviews of services and products are more compelling than any other type of marketing. In addition, they are 12 times more trusted than information provided by a sales/service provider. In fact, 75% of people trust online reviews as much as a personal recommendation. Furthermore, studies show that consumers who interact with reviews are more likely to buy the product or service. Reviews support word-of-mouth referrals, and when a past client, friend or family member refers your services, the person that they refer you to will more than likely search online to find reviews to validate what was said. Positive reviews from satisfied customers reflect your hard work, time, and efforts and indicate successful results. Plus, surveys show that they are key components that encourage potential clients to contact a real estate agent. Facebook, Trulia, Zillow, Realtor.com, Google +, and Yelp are a few sites that allow consumers to write a review for real estate agents or other businesses that rank high on search results. Ask clients to write a review on one or all of the applicable sites after their transaction has closed. Then, establish a strong collection of genuine, flattering reviews, and display them on your website and other social media pages. Real reviews instill trust and confidence in potential clients, so resist any temptation to fabricate reviews and avoid anonymous reviews. Consumers and websites can often recognize fake reviews, and if you are caught, the website can place a consumer alert on your account, or the FTC can take you to court or administer a hefty fine. Don’t delete negative reviews, as it authenticates the positive ones. Plus, surveys indicate that positive reviews outweigh the negative. Instead, respond to any negative reviews in a professional manner that illustrates your remorse, concern, and dedication to finding a resolution. Avoid seeming defensive or placing blame. If necessary, contact the client privately to resolve the issue. Once it is resolved, ask them to write an updated review. Complement negative feedback with positive blogs or news articles that might get more traction and rank higher in a search than reviews. Set up a Google Alert to monitor positive and negative inquiries about you as they are submitted so that you can promptly handle each situation accordingly. According to a recent survey, buyers and sellers agree that a real estate agent’s reputation is more important than their experience. While it may seem overwhelming, many real estate agents have embraced these tools and are implementing them into their marketing plan seamlessly, thus, generating more online presence, enhancing their online reputation, branding their business, and dominating internet searches in their area. In addition to maximizing your online presence and contributing to your reputation, these marketing resources are incomparable in effectiveness and efficiency in comparison to traditional marketing initiatives, proven by increased leads, better client conversion rates, and a reduction in cost and time. As new social media sites, apps, and technology continue to advance, traditional marketing methods will continue to reduce in effectiveness and become more obsolete, as will the agents who use them. Therefore, it is paramount to take advantage and remain adept of the latest online tools and incorporate them into your marketing more and more every day to ensure that your business not only thrives, but survives. ← How Can You Effectively Execute Online Video Marketing to Build Your Business?